AMAZING Slow Cooker Chicken Salad! Use two forks to shred chicken right in the crock-pot after it slow cooks with cream cheese and tarragon. Stir in Greek yogurt, crunchy celery and almonds and dinner is DONE. It’s the perfect make-ahead recipe when entertaining a crowd or packing lunch boxes for the week. I was immediately intrigued and hopped right over to check out the ingredients. The savory versions usually involve cream cheese and bacon. We enjoyed this take on crack chicken by Cookies and Cups very much! 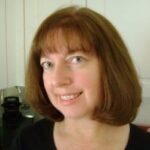 In fact, the inspiration for crock pot chicken salad came after I made it one night. I immediately knew that endless ingredient combinations and spices could transform the creamy chicken base into an entirely new dish. Recently, we added cream cheese to 3 Ingredient Salsa Chicken made in the crock-pot. Also delicious! This version is made healthier by using Greek yogurt instead of sour cream. 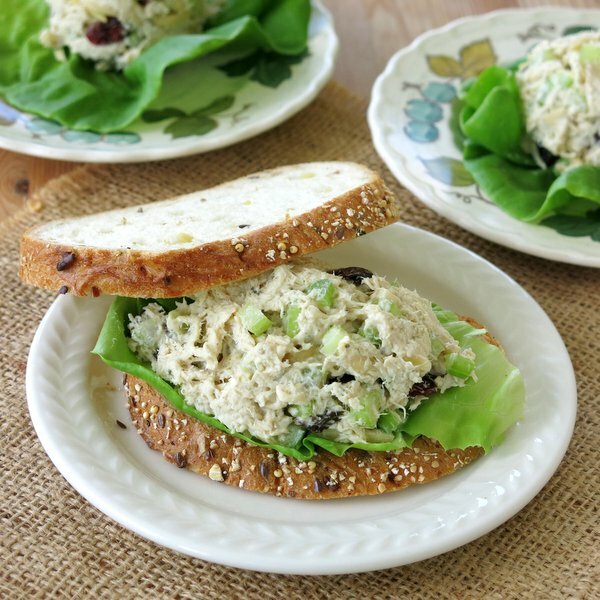 It resembles our Tarragon Chicken Salad recipe except that it uses a crock-pot. Who knew? 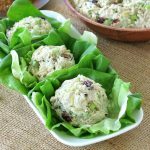 The end result of the experimentation is a “salad” which will light up your world if you are feeding a crowd or prepping lunches for the week. Celery, almonds, and cranberries are a bit healthier than bacon too. But, the end result is equally addictive! 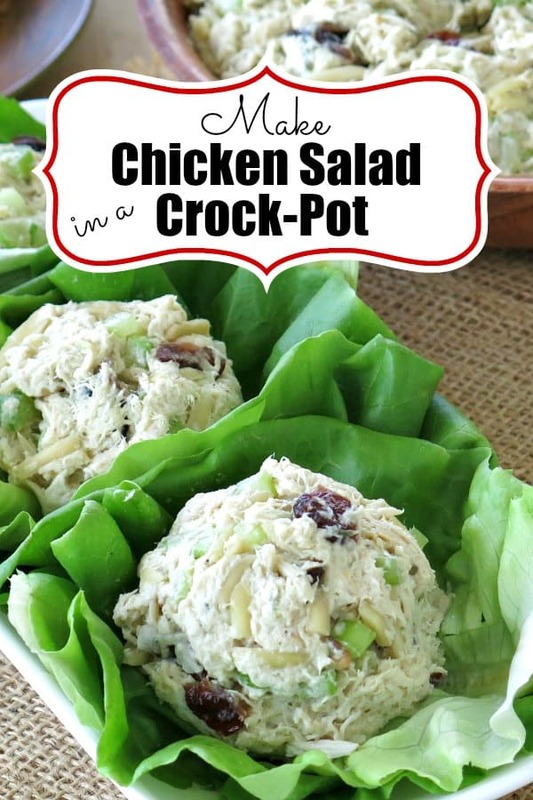 There is something insanely easy about popping uncooked boneless chicken breasts into a crock pot and ending up with a creamy mound of chicken salad later in the day. Simply season the chicken and place it in a slow cooker that’s been misted with cooking spray. Sprinkle tarragon over the chicken and place chunks of cream cheese on top. All of the other ingredients are stirred in at the end. This is what the chicken base will look like after it has been shredded with two forks and stirred to incorporate the cream cheese. The cream cheese firms up quickly so we added a touch of Greek yogurt to keep it creamy. Sour cream would work too. But, you’ll get a protein boost from Greek yogurt. 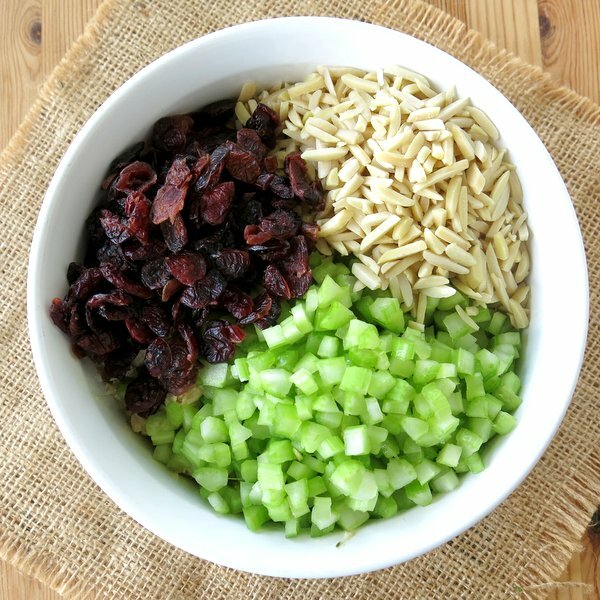 We stirred diced celery, almonds, and dried cranberries into the base. Just about any nut would work. Chopped walnuts are my hubby’s favorite. Pecans are nice too. If you are more of a grape type of family, then use those instead of the cranberries. If you want almost no carbs at all, then leave the dried fruit out. Make this salad ahead of time. It stores very well. No other sandwich fixings are necessary, which is exactly why it’s perfect for entertaining. Simply lay out a platter with bread, lettuces…and a scoop! Serve with a side of chips…traditional ones or choose from this list of 15 Healthy Alternatives to Potato Chips! Add a platter of fruit and you’re done! This easy recipe means more time with family and friends, and less time in the kitchen. Please rate this recipe and tag @DinnerMom or #DinnerMom. We love to see you are cooking up! 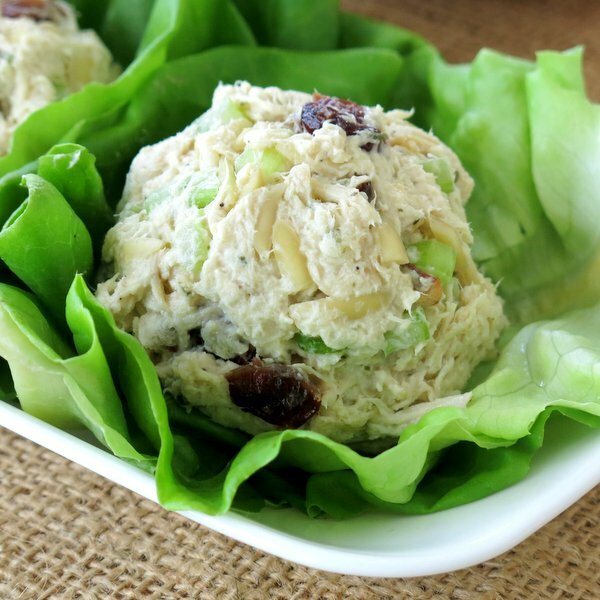 This low-carb Slow Cooker Chicken Salad recipe combines a creamy base with tarragon, Greek yogurt, celery, almonds and cranberries. It's perfect lunch boxes and entertaining. Season chicken breast with salt and pepper and place in slow cooker. Sprinkle tarragon over the top of the chicken. Cut cream cheese into cubes and place on top of chicken. Cover slow cooker and cook on high for about 4 hours or on low for 6-8 hours. 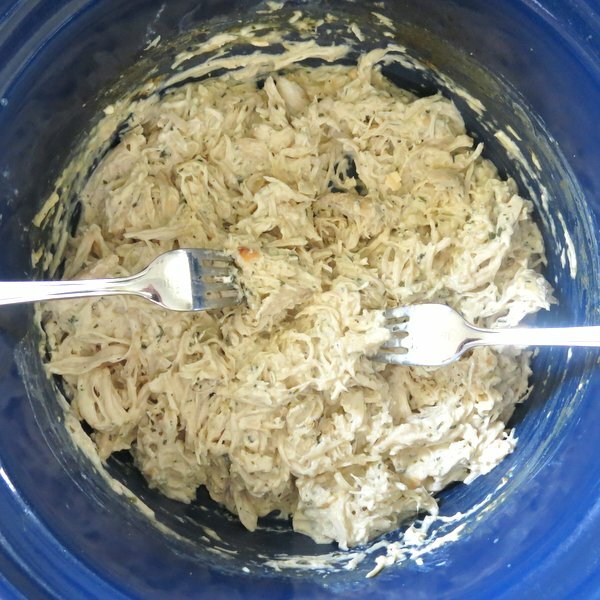 Open slow cooker and shred chicken with two forks, mixing in melted cream cheese. Remove chicken base to serving dish. Stir in Greek yogurt, celery, almonds and cranberries, if using. 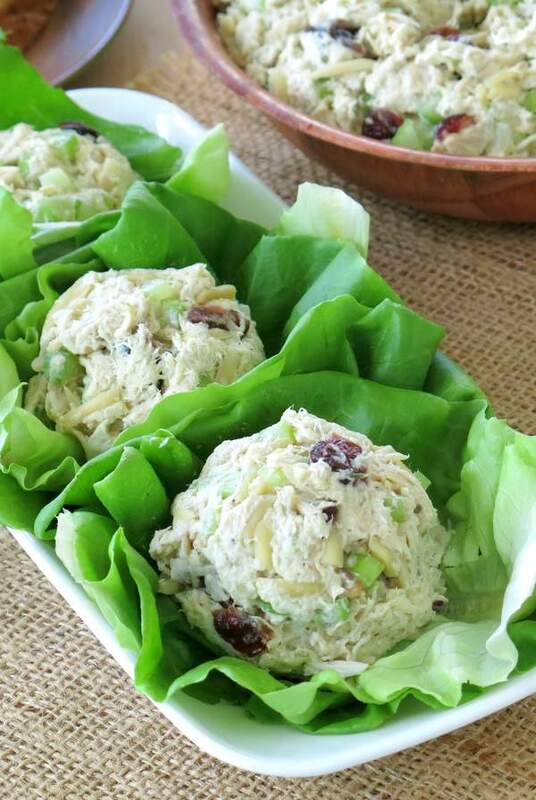 Serve in lettuce cups, on bread with crackers or in a wrap. Sounds delicious with the yogurt and cream cheese. I’m also a big fan of anything you can make in a slow cooker! This is one recipe for the busy days! So easy and I can already imagine this in sandwiches, wraps, even easy pasta salad. I love how versatile this recipe is! Looks like I’ll be getting my slow cooker out! I love the ingredients in this recipe. Tarragon and chicken sounds incredible. This recipe looks so fantastic! 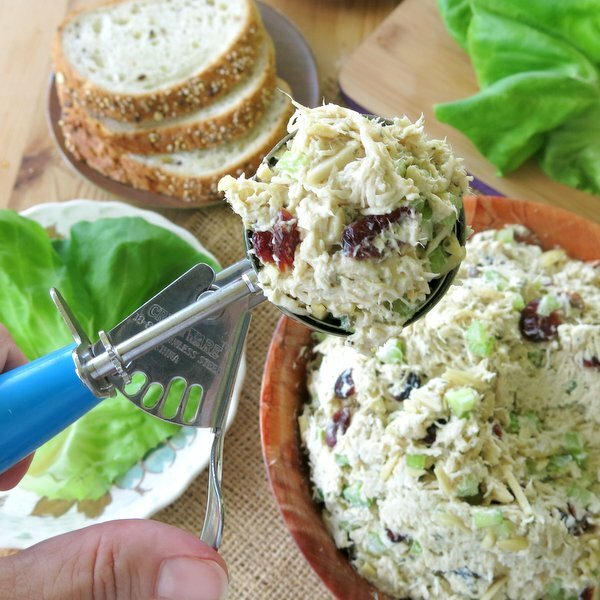 I am such a chicken salad lover — it’s one of my very favorite things! I made this tonight to eat for my lunches this week. I’m really happy with how it turned out. I will say a word of caution, the taragon is very flavorful and tasted throughout each bite. I personally wish I would have cut the amount in half, but I still love the chicken salad! Excited for my lunch this week, thank you for the recipe! i’m glad you liked it! Thanks for the tip on the tarragon amount! Oh! I LOVED this recipe! I am a make-ahead kind of very busy English teacher. So, this is absolutely perfect!